Ingredients: Organic Tapioca Syrup, Organic Evaporated Cane Juice, Organic Palm Shortening, Organic, Organic Cocoa Powder, Organic Brown Rice Syrup, Organic Flavors, Organic Chocolate Liquor, Organic Rice Extract, Peppermint Oil, Beet Juice. 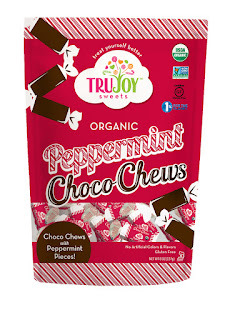 TrueJoy Organic Peppermint Choco-Chews are amazingly delicious! The flavors in the Peppermint Choco-Chews pair perfectly. They contain the perfect amounts of peppermint and chocolate and taste absoultely heavenly. I love that TrueJoy Organic Peppermint Choco-Chews are organic, Non-GMO and Gluten Free. These would be perfect to set out at a holiday party or stuff stalkings with. My family and I love TrueJoy Organic Peppermint Choco-Chews and I highly recommend them! 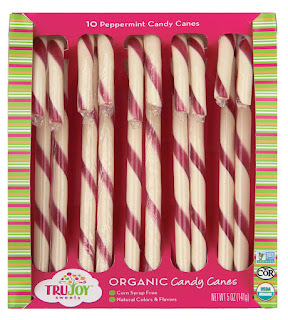 TrueJoy Organic Candy Canes are so good! These are quite honestly the best candy canes I've ever had! I love that these are made with all natural organic ingredients. No longer do you need to feel guilty for allowing your child to participate in the wonderful tradition of candy canes at Christmas time. I also really like that the color in these candy canes come from real food. TruJoy also donates 1% of sales to environmental causes which is awesome. I love companies that support great causes and I highly recommend TrueJoy Organic Candy Canes! Click HERE to find a location near you that sells TrueJoy! Click HERE to learn more about TrueJoy!